As a coach, one of the most common questions posed to me by athletes, whether they are tri-rookies or emerging elites, is "what can I do to get faster?" Most tend to be looking for the key workout that will help push them to new heights. Others want to know what new piece of equipment will help them shave a gram off their bike set-up or make them a fraction more aerodynamic. One of the biggest lessons I have learned in the 30 years I have been exposed to endurance sports is that consistency and commitment to the small stuff are paramount to success. And these two items are not mutually exclusive. It is generally the attention to this small stuff, such as functional strength, nutrition and recovery that helps keep athletes from sustaining injury and thus allows them to be consistent in their training. Most athletes have heeded the recommendation to incorporate strength and flexibility training into their regimen and some actually include these items as entries in their training logs. And, while I know we all break from time to time, I can't think of a more disciplined group when it comes to nutrition. However, if there is one common shortcoming I would single out in the Type A-leaning triathlon population, it's the lack of focus on recovery. While in part this means breaking ourselves from the "more is better" mentality, it also means doing the little things that help our bodies bounce back for the next training session. A number of people have been asking about ice baths lately, possibly due to the visibility successful marathoners such as Paula Radcliffe and Meb Keflezighi have brought to the practice. The general theory behind this cold therapy is that the exposure to cold helps to combat the microtrauma (small tears) in muscle fibers and resultant soreness caused by intense or repetitive exercise. 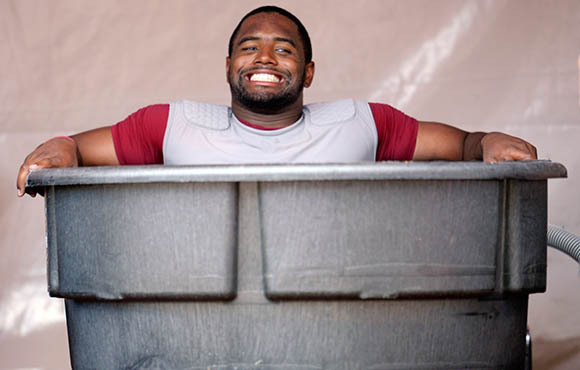 The ice bath is thought to constrict blood vessels, flush waste products and reduce swelling and tissue breakdown. Subsequently, as the tissue warms and the increased blood flow speeds circulation, the healing process is jump-started. 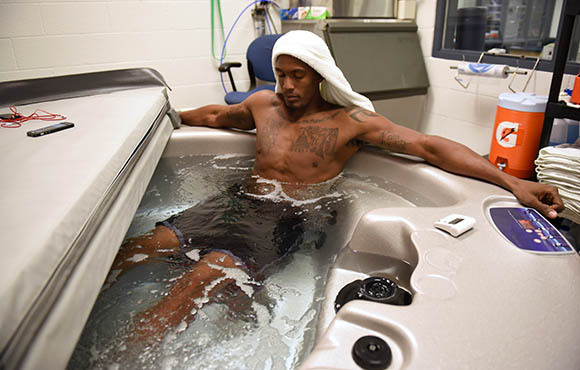 The advantage of an ice bath submersion is that a large area of intertwined musculature can be treated, rather than limiting the cold therapy to a concentrated area with a localized ice pack. So, should ice baths be one of these routine activities to help you gain an advantage on your competition? It depends on whom you ask. The research to date is inconclusive, and in asking elite coaches, you are likely to receive a varying degree of significance placed on the practice. However, most agree that while it may not be guaranteed to help, it generally can't hurt. 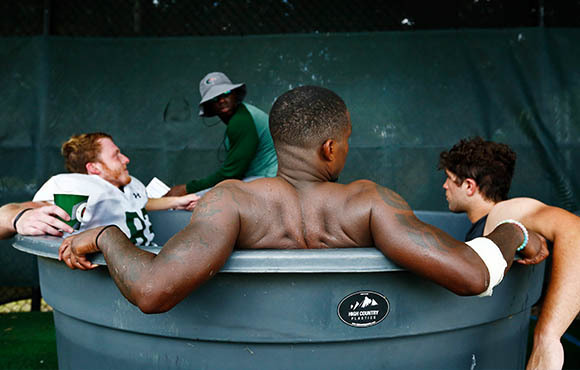 My personal recommendation is to treat this much like any other part of your training program: Experiment with ice baths at a period in your season when you are not approaching a key race and see how your body responds. Given this is uncharted territory for many of you, I want to provide some general guidelines to ensure a safe emersion (pun intended) into this cold therapy known as ice bathing. Be conservative with water temperature as you get started. 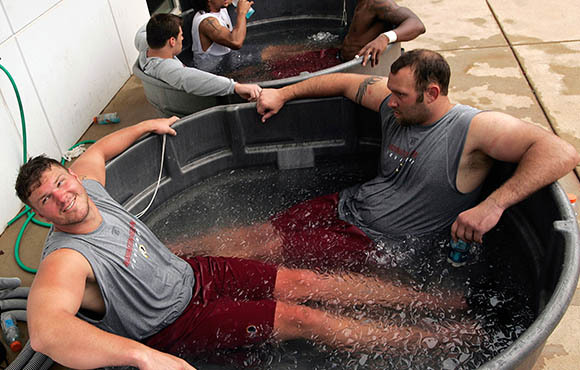 Most rehabilitation specialists recommend a water temperature between 54 to 60 degrees Fahrenheit. Consider starting a bit higher and inch this downward a degree or two each exposure. Recognize that each individual will have his or her own cold threshold. Play within your personal comfort zone and consider investing in booties (toe warmers made of wetsuit material) as your toes are likely the most sensitive body part to be submerged. Overexpose! At the recommended temperature range noted previously, 6 to 8 minutes should be sufficient. Unless supervised or you have history with ice baths, do not exceed 10 minutes. Assume colder is better. Spending a prolonged period of time in water colder than 54 degrees could be dangerous. Be aware that moving water is colder water. Much like the wind chill created when you ride, if there are jets in your ice bath and the water that is warmed at the skin's surface gets pushed away, the resulting impact of the water will be cooler than measured by the thermometer. Assume 54 to 60 degrees or bust. Cool water (say, 60 to 75 degrees) can still be beneficial—as can active recovery (very light exercise to facilitate blood flow to musculature). Seek to simplify. 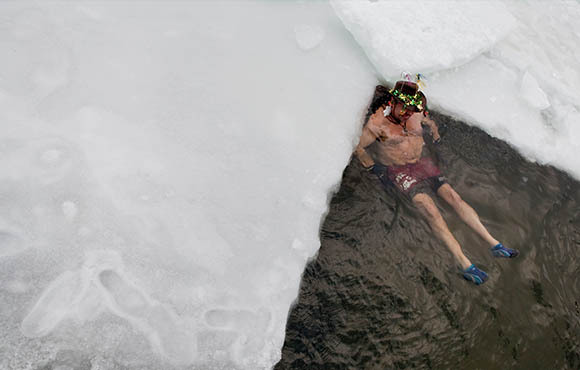 Building a personal ice bath daily can be a daunting task. Look for a gym that has a cold plunge, or if you live close to a river, lake or the ocean, keep tabs on the current water temperature. Rush to take a warm shower immediately after the ice bath. The residual cooling effect and gradual warming are ideal. Consider initial warming options of a sweatshirt, blanket and/or warm drink... But DO take the shower if you are unable to warm yourself.